Lucky Cloud have been on my radar for a little while. I saw a product of theirs in a blog post, thought ‘Ooh, that looks interesting,’ and then didn’t do anything about it. 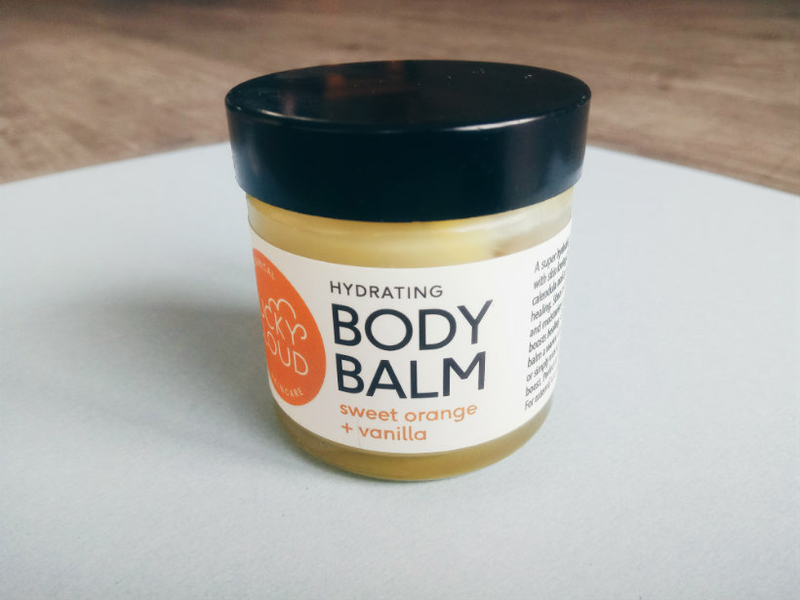 So when the brand appeared on LoveLula, I decided it was about time I tried something and swiftly added the Sweet Orange + Vanilla Hydrating Body Balm* (v) to my shopping basket. I’m a sucker for anything with a citrus scent. Lucky Cloud make luxury, cruelty-free products with natural, plant-based ingredients and everything is suitable for vegans. Their products are free from formaldehydes, sodium lauryl sulphates, sodium laureth sulphates, mineral oil, and animal ingredients. All their packaging is recyclable, including the shipping bags and boxes. This is exactly the kind of approach I look for, so I was looking forward to trying the body balm for myself. Let’s see if it lived up to expectation. The balm comes in a sturdy glass jar with a screw-top lid. Normally I would pick a tube or pump bottle over a jar (even though jars look that much fancier) but in this case it’s much easier to scoop the product out because it’s quite thick. The first thing you notice when you open the product is the scent — it’s very sweet, and smells like a Terry’s Chocolate Orange, or the jelly part of a Jaffa Cake. The vanilla really comes through, but the sharpness of the orange is (thankfully) still there. Despite the scent being so strong, it’s never irritated my skin, even the cracked, drier areas on my elbows and hands. The body balm’s texture is thick and a little sticky, but not unbearably so. It reminds me of Vaseline, but this sinks into the skin and moisturises it, instead of just acting like a barrier. 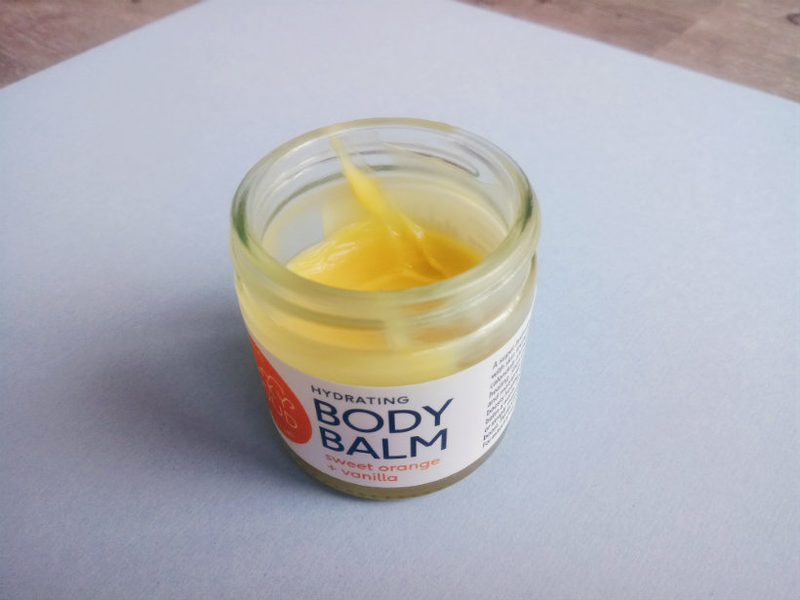 The pot holds 60ml of product, so I reserve the balm for the driest areas of my body — elbows, knees, feet — and anywhere else that needs a bit of extra hydration and comfort (at this time of year, my hands always need help). I alternated using between this balm and Lyonsleaf’s Calendula Cream when I had a cold last week, and both of them soothed the skin around my poor nose and stopped my skin from getting so flaky. It can also be used on eyebrows and eyelashes, post-shave, and as an aftersun. At £16.50, it’s not exactly a budget buy, but Lucky Cloud have created a lovely, soothing balm that will hydrate even the driest of winter skins. One to invest in if you want a natural, cruelty-free product (and you don’t mind smelling of chocolate orange). How do you feel about multipurpose products? Are they worth the money? Let me know in the comments. *Product sent by LoveLula for consideration of review. As always, all words and opinions are my own.